BRANDON – Brandon University’s (BU’s) biggest Homecoming yet begins with a full evening of activities this Thursday, Oct. 11. 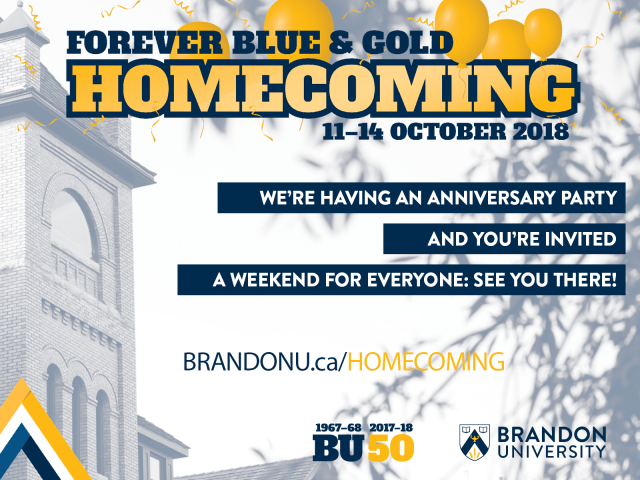 With the theme Forever Blue & Gold, Homecoming 2018 is a four-day community celebration, capping a year of events that mark the 50th anniversary of BU’s first year as a university. The Class of 1968, the first graduates to receive BU degrees, will be recognized at the Dinner and Awards on Saturday night. While Homecoming is always open to more than just BU and Brandon College alumni, this year’s party offers more than ever to the entire community. Other events planned for this weekend include a free Saturday evening music festival, a day of family activities, a Bobcat basketball reunion and a Friday keynote talk by Col. Chris Hadfield. The Homecoming Information Booth will open in the Healthy Living Centre (HLC) on Thursday at 1 p.m., and will run all weekend long, helping guests to navigate through a wide range of activities, many of which are free. 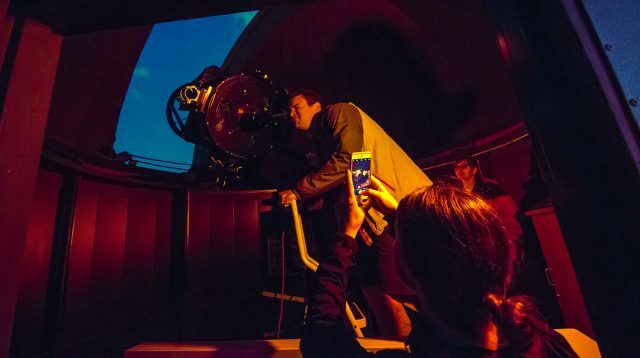 The Thursday through Saturday schedules will all finish Under the Stars, with viewings at the BU Observatory. The first of three consecutive nights of viewing at the BU Observatory will take place on Thursday. A pair of talks by Hadfield will be in the spotlight on Friday. The Canadian astronaut’s first talk will be delivered to local school children, while the second will be presented to a sold-out audience at the Western Manitoba Centennial Auditorium. Bobcat games and food trucks, which will remain on campus through Saturday’s events, are also planned for Friday. Saturday will expand even further with the Family Fun Day festivities, starting with a free morning screening of The Lego Movie, and followed by an afternoon of activities for all ages. The entertainment will peak on Saturday night as Fifty Fest hits the stage. Presented by Clarion, Fifty Fest is a free concert, headlined by Juno nominated band Royal Canoe and featuring special guest Begonia. Other Saturday events will include the New Beginnings Research Conference, sharing BU research with the community, the Sports Wall of Fame induction ceremony a book fair featuring alumni and faculty authors, as well as class reunions and alumni recognition at the Dinner and Awards. Homecoming participants can catch their breath and say their goodbyes on Sunday at the Farewell Brunch. While most of Homecoming is open to the public, please note that tickets are required or recommended for some events. For details and a full schedule of events visit BrandonU.ca/Homecoming.